First, it went one way. Then it went the other, and eventually at half past three in the morning, after one miracle seventh street, it went the way of Dan Matsuzuki who takes home $364,387 after winning his first WSOP gold bracelet in Event #64: $10,000 Seven Card Stud Hi-Lo 8 or Better Championship. "It still hasn't hit me really," said Matsuzuki. "I wasn't even going to play this event, but my buddy convinced me. 'Come on; Let's gamble' - those were his exact words. He took a piece of me and we registered on Day 2 and I just got a good run of cards." Matsuzuki wasn't completely entering on a whim, however, and there was some thought behind his late Day 2 entrance. "There was a little strategy behind [registering on Day 2]. I know these guys have a little edge on me in the tournament and have more experience and stuff, so I just felt like lessening the amount of time in the field was to my advantage," Matsuzuki admitted in his post-win interview. 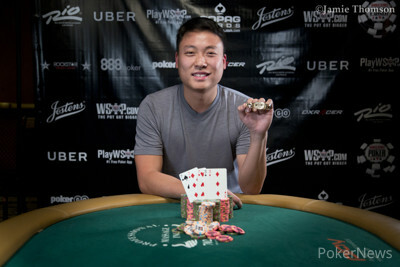 It certainly paid dividends, giving the Tempe, Arizona, resident his maiden bracelet for his first ever career tournament title and largest career cash by some margin, with Matsuzuki's previous best a ninth-place finish in the $1,500 Ten Game Mix Six Handed back at the 2015 WSOP for $9,018. Matsuzuki came into the final table last in chips and was just trying to survive, according to him: "I got heads-up with Scott [Bohlman] and I know he's one of the better tournament players around. I just felt fortunate enough to take home the victory." Matsuzuki considers Stud Hi-Lo the "most entertaining" of the mixed games and credits a good run of luck to finally clinch his first WSOP gold bracelet. "When the limits get so high, it's whoever gets lucky at the right time. They're the one who is going to end up with the bracelet. Fortunately enough I caught a couple of good cards on seventh street, and that's it!" said a modest Matsuzuki. The day started with 15 players, including reigning champion Chris Vitch. It took a full level for start-of-day short stack Roland Israelashvili to be eliminated. Two-time bracelet winner Jesse Martin (13th - $18,897) and Mike Watson (12th - $22,365), were among the other players to miss out on the final eight, with Andrew Kelsall (11th - $22,365), Jack Duong (10th - $27,233), and Tom Koral (9th - $27,233), eliminated in quick succession to bring play down to the official final table. At this point, it was Scott Bohlman heading the chip counts, with start-of-day chip leader Vitch close behind, and eventually surpassing him during the opening exchanges. Vitch would boost his chip stack further with the elimination of Joseph Michael in eighth place before a sequence of bad cards sent Bryce Yockey to the rail in seventh at the hands of Matsuzuki. It only took a few hands after the dinner break to send the next two players to collect their payouts. First, Vitch eliminated Jerry Wong and then Ken Aldridge eliminated Daham Wang to bring play four-handed. As the limits increased, the stacks four-handed fluctuated; one minute Vitch or Matsuzuki would hold the lion's share of the chips in play, and the next the stacks would be dead even. In fact, both of these players at one point held half the chips in play. In the end, it was Vitch who succumbed as Matsuzuki tightened his grip on the chip lead and sent the defending champion to the rail in fourth. Over two hours later, and after some seesawing action between all three players, Aldridge was eliminated to bring play heads-up. If players and spectators thought that the action would settle into a steady rhythm, then they were mistaken. With the limits continuing to climb the two continued to bring the action, with the chip lead swinging between the pair almost after every pot. Despite the large limits, neither player was in any danger on one specific pot, and only a bad run of cards would lead to their demise. And so, with neither player seemingly able to win consecutive pots to clinch the victory, the tussle ensued. With seven million chips in play, both players touched the five million mark; seemingly one step away from victory only to get pegged back and see the chips shift the other way. 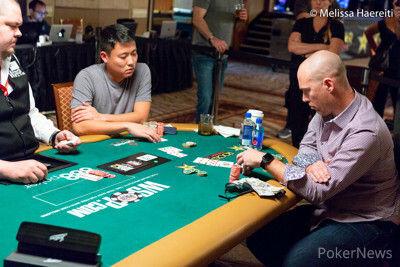 Eventually, as play entered the second additional "courtesy level" of the night in order to see out a victory, Matsuzuki and Bohlman got their chips in on fourth street. Despite Bohlman making a straight on fifth street, the one vital river card appeared to give Matsuzuki a full house, along with the bracelet and $364,387 in prize money. That concluded the PokerNews live coverage for this event, but with the third and final flight of the Main Event getting underway on Wednesday, 4 July, this is far from the last of the live coverage available this series. Join us then for more World Series of Poker action. Dan Matsuzuki brought in and Scott Bohlman called. Bohlman bet on fourth street and Matsuzuki raised. Bohlman called and was all in. Bohlman had made a straight by fifth street and Matsuzuki had trips by sixth street. 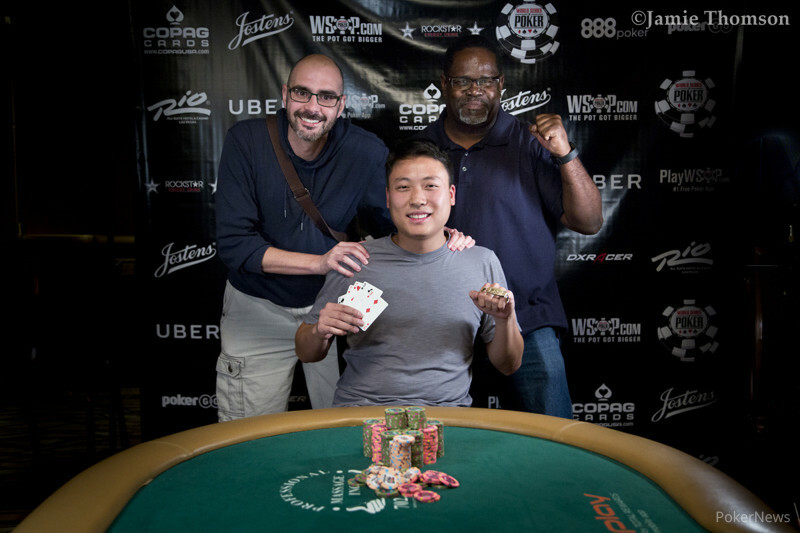 Bohlman drew a on seventh street, but Matsuzuki drew a improving to a full house and eliminating Bohlman in second place for $225,210. Scott Bohlman was the bring in. Dan Matsuzuki completed and Bohlman called. On fourth street, Matsuzuki bet and Bohlman called. On fifth street, Matsuzuki bet again. Bohlman made it two bets and Matsuzuki called. On sixth street, Matsusuzki checked. Bohlman bet, and Matsuzuki called. On seventh street, Matsuzuki checked. Bohlman bet. Matsuzuki then raised and Bohlman dropped into the tank. He leaned back and sighed and tanked for nearly five minutes, only saying a few words, talking to himself. Finally, Bohlman decided to call. Matsuzuki turned up his for a flush and that was good to earn him the big pot. 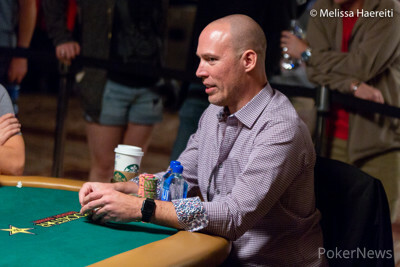 Bohlman was left with just 340,000 chips after the hand. Dan Matsuzuki brought in and Scott Bohlman completed. Matsuzuki called and bet on fourth, fifth, sixth and seventh street with Bohlman making the call. "Good call," said Matsuzuki, "Sixes," he said. Bohlman showed and took down the pot. Dan Matsuzuki was the bring in and Scott Bohlman completed. Matsuzuki made it two bets and Bohlman called. On fourth Bohlman bet and Matsuzuki called. Both players checked on fourth. On fifth street, Matsuzuki bet and Bohlman folded. Dan Matsuzuki brought in, Scott Bohlman completed and Matsuzuki called. Bohlman bet on fourth street and Matsuzuki called. The pair checked fifth street and Bohlman bet fifth street. Matsuzuki called. Bohlman check-called a bet on seventh street and was shown for two pair and took down the pot. Dan Matsuzuki completed from the bring in and Scott Bohlman called. On fourth both players checked. On fifth, Matsuzuki bet and Bohlman made it two bets. Matsuzuki called. On sixth, Bohlman continued out with a bet and Matsuzuki made it two bets. Bohlman called. Scott Bohlman completed and Dan Matsuzuki called. On fourth street, Bohlman bet and Matsuzuki called. On fifth street, Bohlman checked and Matsuzuki bet. Bohlman called. On sixth, Bohlman checked. Matsuzuki bet and Bohlman called again. On seventh, both players checked. Bohlman showed for two pair and it was good as Matsuzuki just flashed a queen and mucked. "Tommy 'Slowroll' Koral Strikes Again"